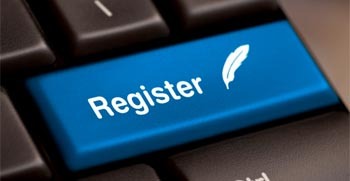 1) Credit card payment – sign up online. 2) Cash or Check payment: You may pay with cash or check (only) at your first class (no credit cards accepted in class). Please bring your Paypal receipt to class with you for payment verification or pay in class with cash or check. No refunds once signed up with our school. COURSE INCLUDES: Textbook & online access to NHREC State Laws & Rules. Our goal is for you to pass the exam the first time — but, if for some reason you don’t — you may retake your class series for FREE! A candidate must be eighteen years of age and complete a 40-hour state-approved course prior to taking the exam to be eligible for a salesperson license. Prior real estate knowledge is not required to participate in the course. The material is designed to assist you in understanding each subject so that you may successfully pass the license exam; but just as one would for any other exam, it will be necessary to do study work on your own time. Once you receive your salesperson license, it may be used for either residential or commercial property – for sales or rentals. After a student completes the pre license course, we will provide you with an education affidavit necessary for the exam and the toll-free phone number to schedule an appointment. The student decides when and where to take the state exam. The testing centers are located in Portsmouth, Concord, Manchester and Nashua. Schedules vary but generally there are test dates on Monday thru Saturday, mornings and afternoons. Exam appointments should be made once a student finishes the course. The exam consists of two sections of multiple choice questions — the National portion and the New Hampshire law portion. A score of at least 70% is required on both sections to pass. The exam fee is $155.00. Optional but highly recommended package! We have two NH State informational books. 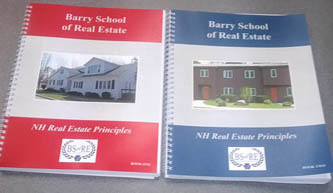 Our red book, New Hampshire Principles is $70 and our blue book for salespersons and broker's licenses is $70. We do not ship or send confirmation of payment. Please bring your receipt to class to pick up books. Thank you Susan and Jim!